This B&H Kit combines the Allen & Heath SQ-6 48-Channel / 36-Bus Digital Mixer with 24+1 Motorized Faders with six Allen & Heath ME-500 16-Channel Personal Monitor Mixers and six sets of universal in-ear monitors to create a professional mixing and monitoring platform well suited for live sound and studio applications. The Allen & Heath SQ-6 is a 48-channel, 36-bus digital mixing console well suited for live sound, corporate A/V, recording studios, and houses of worship. The SQ-6 features 24+1 motorized faders and 24 professional-quality microphone preamps. There are also eight stereo FX engines with dedicated return channels and access to the RackExtra FX library. 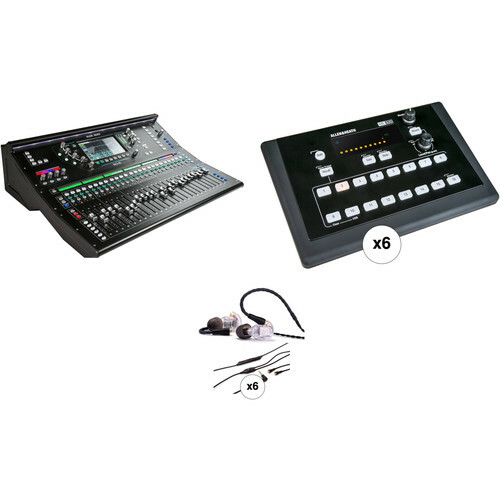 The mixer's 12 stereo outputs (configurable as groups or auxes) are well suited for in-ear-monitor setups, while the Auto Mic Mixing function offers quick and easy operation over multiple microphones for conferences, panel talks, and more. At the heart of the SQ-6 lies the 96 kHz XCVI Core FPGA engine, which delivers professional, high-resolution audio quality, ultra-low latency (less than 0.7 ms), variable bit depth for precision and noise performance, mix coherency down to the sample, and the power to handle high channel / mix counts and ample FX processing. The SQ's DEEP processing architecture allows you to hand-pick boutique compressor and preamp emulations and embed them directly within the mixer's inputs and mix channels, all without adding system latency or setup hassles. The front panel is centered around the mixer's 7" capacitive touchscreen and framed by an array of high-grip, illuminated encoders, which offer clear visual feedback and quick, hands-on control. You can drag-and-drop channels and mixes to any strip with custom naming and color coding on the strip display, allowing you to build a mix environment that mirrors your workflow. The SQ-6 offers softkeys, which can be freely assigned to any function for a customized and advanced workflow. The on-board recorder uses a USB Type-A port to record stereo and multitrack sessions to a flash drive. The recorder can also playback stereo and multitrack files, making it well suited for virtual sound checks and studio mixing. The SQ-6 offers expansion options via Allen & Heath's stage box expanders, or install an optional Dante or Waves card to adapt and expand using the latest digital technologies. SQ is fully compatible with the ME Personal Mixing System, allowing performers to take control of their own monitor mixes. Any number of ME-1 and ME-500 personal mixers can be daisy-chained from the mixer's SLink port, or from a connected remote expander. The Allen & Heath SQ-6 ships with a power cord. Box Dimensions (LxWxH) 32.5 x 27.0 x 14.5"